In the 1850 census, Francis (Frank, reported here as a girl, wasreported as 1 years old, but the birth date on his grave is 22 March1850, which is just a few weeks before the census. 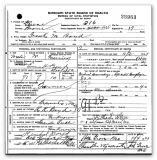 Frank's death certificate reports he died in Boone Townhsip of GreeneCounty. There is no current township reported by the neame of Boone.The medical report and burial took place in Ash Grove. Frank M Boyd was the son of R K Boyd and Lucinda Rush. He was one ofeight children. He was married to Emma H Miles, they had ninechildren.